Well, they’re not really secrets — just super solid ideas. All eyes will be on you during your first dance, which means it’s the perfect opportunity to shock your guests. Imagine starting with a slow dance to “At Last” and then suddenly switching to a fast, s*xy Latin dance or a jazzy swing step. It’ll totally throw your guests for a loop and set the tone for a lively dance party. Don’t forget that a reception is a party! Let your guests know that it’s okay to cut loose after a formal ceremony by passing out crazy wedding favors at the reception. A few of our favorite ideas? Funky masks, noisemakers, or Silly String. We even know one couple who handed out neckties and encouraged their guests to tie them around their heads on the dance floor. Quirky, but definitely fun! Sometimes the best parts of a reception are the things guests don’t see coming. Surprise your guests with unexpected entertainment during the cocktail hour or reception, like a belly dancer, a mariachi band, or even a salsa dancer. 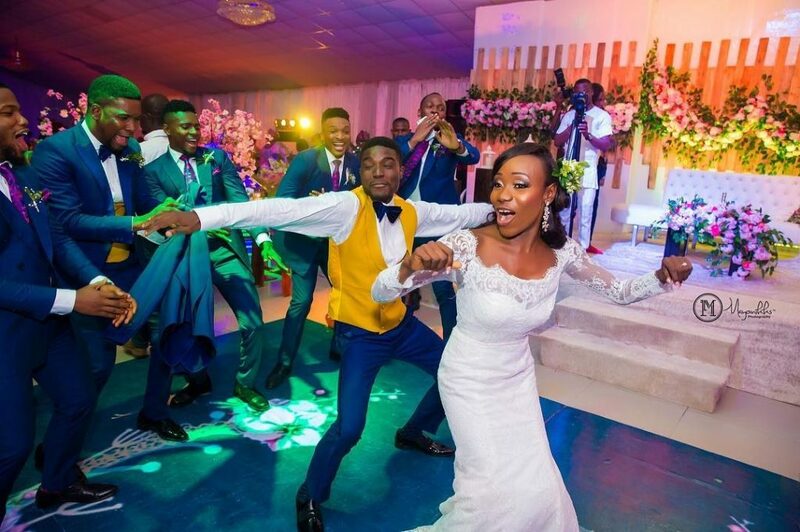 Okay, this is an obvious one, but it made the list because music is a major fun factor at the reception and it has a lot to do with how long your guests will stay. The last thing you want to see is your dance floor clear out when the “chicken dance” comes on. So, make sure to talk to your DJ about your do-not-play list. Whether you’ve hired a band or a DJ, if you want to keep the dance floor packed (and we’re guessing you do), plan a playlist of songs that will please the crowd, not just you two. You may love obscure indie rock, but now isn’t the time to show off your discerning taste in music. People love dancing to Lady Gaga and Madonna — so let them! Let’s put it this way: You won’t have a good time at your reception if you can’t breathe, right? So after the first dance, swap your veil and train for a little white dress. (This applies to grooms too — depending on the formality of the wedding, guys can change out of a restricting tux into a more relaxed suit.) If you and your new spouse are comfortable enough to move freely, you’ll dance more, chat more and laugh more, and that’ll rub off on your guests.